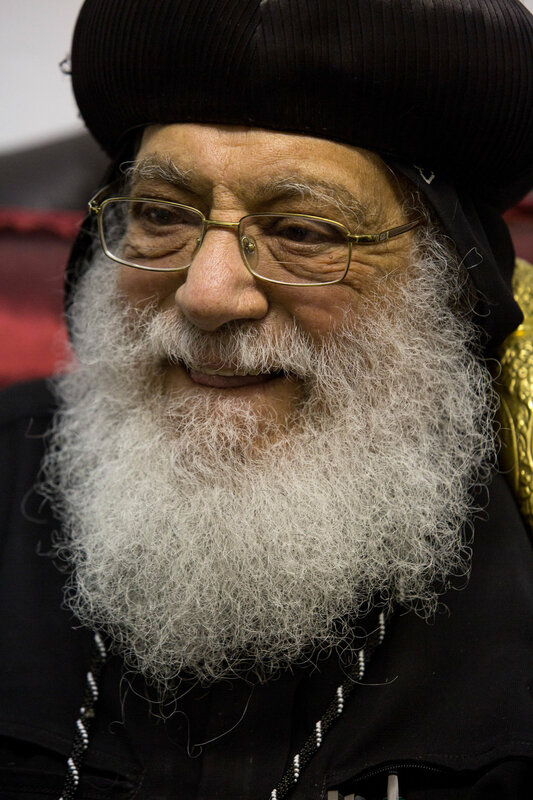 JOHANNESBURG -- Bishop Antonious Markos isn’t slowing down at age 82, having planted Coptic churches across Sub-Saharan Africa and helped lead an expansion of the Christian message to Coptic youth worldwide. Bishop Markos welcomed members of The Media Project (Paul Glader, Emeke Izeze, Wesley Parnell and Vicky Abraham to his office and church in a leafy neighborhood of Johannesburg this past June to talk about his life and work. He regaled us with stories about how his mission in South Africa has seen 35 Coptic churches spring up across 10 African countries. Question: You said you started as a medical doctor before going into ministry. How did you change careers and become a bishop? Bishop Markos: Yes. We were raised in a poor family. My mother was really young, and she just knew how to read, but no more than that, and my father was a middle-class man with a love of Egypt. And we were raised in the… church in Cairo. We lived really close to the church. And in the meantime, when I was really little, there was a man called Habib… who is now canonized as a saint. He’s the one who established the Sunday School movement in Cairo, in Egypt. And really, he made it to spread everywhere. We are all fruits of the Sunday School. Then, he said that children should not only stay in the sanctuary to listen to the sermon with the elders. They should have something with their own sort of milk, because the other food is for the elders, not the children. And all of us, even the pope of today… He is one of the sons of the Sunday School. The Sunday School movements in Cairo today without his [Habib’s] help, we would not be here. They meet every week, and now there are over 5 million [Coptic] churches today, and they are served by volunteers. And we Copts number today in Egypt in the 20 millions! The Muslims tried to make for their own, but now the new President of Egypt, Abdel Fattah el-Sisi, is a different sort of person because he is 50 percent Christian, really. You know I started my service in Ethiopia in 1966, when I was 30 years of age, and I stayed there for nine years, then I went back to Egypt, and then I became a bishop. And then I lived in Nairobi, Kenya for 23 years. I have three different citizenships: Kenyan, South African and Egyptian. Question: Oh wow. So, Sisi is supportive of the Christians there? Question: So, has there been a change in Sisi in recent years? How has become someone who’s become more friendly to religious pluralism and the Christian community? Bishop Markos: Egypt has a very serious type of root, the Muslim Brotherhood. The Brotherhood came to Egypt one year without the president (in 2011), but they ruled the country, and then [Mohamed] Morsi became the president. And the whole Egyptian people, either Christians or Muslims, we tasted the bitterness of a real evil, very extreme Islam… and terrorism. Everyone in Egypt has tasted it. And that’s why we said, “if this is Islam, we don’t want it as a religion.” That’s why in Egypt nowadays, take my word, there are at least 15 to 20 million Muslims who do not believe in Islam… There are still a lot of Muslims… They are beginning to question some of the underlying reasons for Islam. In fact, I can say that Egypt was ruled by the Muslim Brotherhood for one year, as a party who ruled the country. Then, they choose Morsi for the president, and they [the Muslim Brotherhood] left. He [Morsi] made Islam to be so negative, so dirty, so meaningless, so aggressive — killing, terrorism… That’s why for the first time in history, 40 million people stood in the streets and protested in Cairo, to say that no, this is enough. No to the president Morsi — this is enough, we don’t want this. But anyhow, we [the Copts] have really suffered. So, in fact, Egypt has accepted Christianity only nine years after the resurrection of the Lord Jesus, through Mark, who was born in Libya. He was from the family of the Messianic Jews. And he was there in the day of the Pentecost when the Holy Spirit came to the apostles with the tongues of fire and the signs, and Mark became a disciple of Christ and he wrote one of the gospels. Question: We spoke briefly earlier about Thomas Oden who passed away in 2016. Can you talk a little bit about your friendship with him and what his scholarship meant for you, and the Coptic church? Bishop Markos: The story of Thomas Oden is a unique one. There is no one of equal interest as much as this man. He is one of the realest of our time, our contemporary time. Thomas Oden started by doing what? By making commentary on the whole Bible, from the ancient African writers on. So he started to look at the writers of the second century, like Saint Anthony who established the monastic life, and Saint Pachomius, who also was monastic… the founders of faith, like Athanasius who convinced Arius to defend the divinity of Christ, because Arius said that Christ was not divine, that he was not God, that he was only man. Arius was an Egyptian, and Athanasius was called on five times to defend the faith. And he [Oden] started to read from all the ancient fathers, all of them. And, he started to make commentaries—I have the commentaries by the way—they are wonderful! But what happened is that Thomas Oden was a Methodist, a protestant. When I met him, he was not a Methodist, he was an Orthodox, which means he believes in the ancient church, the early church fathers. When he studied this and made the ultimate commentaries on the Bible, he discovered the richness of the spirit, and the depth which he could not find anywhere. Question: Could you explain what happened when Thomas Oden visited the cave of Saint Anthony? Bishop Markos: Yeah, Thomas Oden went to Egypt more than once, and he loved it. He went to the Monastery of Saint Anthony and he spent the night there. You know, Saint Anthony is the first monk in the world to establish monastic life. And, it spread to Europe after that through Saint Benedict. Now, for Thomas Oden, there was a cave in which Anthony lived, which took about two hours climbing on the mountain to reach. And when he arrived there — I went to that place — and you cannot go facing front, you have to go by sliding sideways… So Thomas Oden, he was still young, he was about 60 something. So he went up. And when he went up, he did go through the crack in the mountain. It’s a crack, not a hole. In Hebrews there is a verse about those who live in cracks in the mountains because they loved Christ. So, Thomas said, “This is amazing! How can this man live here?” Then he stayed there — Oden lived there, he slept there, he sat there and prayed there, and when he came out, he told me, “When I came out of this cave my life had changed totally! I really felt something which is totally holy, one of the holiest spots in the world!” This man lived about 90 years and he went there praying all the time. And our pope… who died, I told him that Thomas Oden came out of the cave and said that his life had changed with the spirit of Saint Anthony. Anyhow, I had the very last book Thomas Oden wrote… that’s called The Rebirth of African Orthodoxy. And he meant that he would write the theoretical part of this book now that orthodoxy in Africa is spreading. But now, he also mentions our mission [in South Africa]— now I am 50 years in that [mission] in this nation. I started in 1966, so in 2016, it became 50 years. Question: Tell us about your 50 years here and how you see the Orthodox church in South Africa and the church in South Africa developing now. Bishop Markos: Egypt has been Christian since the nine years after Christ was resurrected. And, Saint Mark started the group of people that was big—very big. And then, he ordained the bishop in Egypt who was called Ananias, a shoe repairer. Because Mark was arriving in Alexandria from a big trip, with only sandals on his feet… he looked for a shoe repairer. He found an Egyptian named Ananias. [Ananias is said to have hurt his hands fixing Mark’s shoes and Mark healed him in the name of Jesus Christ.] The Egyptian had Saint Mark take the tongue of the Egyptians. He took the tongue of the Egyptians because he was on the day of Pentecost, new tongues were given to them. So Mark came with the tongue of Egypt. So there he went around and spoke to the people on various issues… He showed them that it wasn’t magic, but it was the power of Jesus Christ. You have been praying about God, and this is the God who has healed you. This man became the first bishop of Africa. Mark is considered out first pope. And now the present pope is 118. Question: He’s the 118th after Saint Mark, he’s number 118? Bishop Markos: Now maybe there are some gaps, four or five years, but our papacy has been very consistent. By the way, the word “pope” is from Coptic language: “baba abba” because the Coptic language, even Rome, the popes of Rome, they acknowledged that they were from Coptic Egypt, using Coptic language. Anyhow, so Mark ordained the bishop, and priest and all, and the church in Egypt began. And the church of Egypt started to spread as many of the Egyptians became apostles. And, after that he made missionaries who went into Nubia and North Africa. Even himself, he went into Europe, Saint Mark before he was martyred in Egypt. He was martyred in Egypt in the year May 8, 68 A.D. on Easter Eve. He was martyred in Alexandria. Because his preaching was so powerful. So powerful, that many of the pagans in Egypt left their life and their direction and went in the way of the Lord Jesus. It was so powerful, and the priests of the paganism were bankrupt, and they said that we should kill the man. So they attacked him in the church when he was there in the sanctuary, finishing the liturgy. The people, the Christians made a blockage so the killers could not enter, until Mark could finish reading the liturgy. Then, after that they started to kill the Christians until they reached Mark. They took him and they tied a rope around his neck… and they broke him into pieces. Then, the Lord Jesus appeared to Mark and touched him and said, “My son Mark, you have suffered long for me.” One day more, and you are going to come to the glory. Mark died the next day. We have relics everywhere. We have relics in our monasteries of Saint Mark. Question: The Copts have suffered in recent years, but that’s been throughout, from the start, right? Bishop Markos: You are very right in that. Our church for over 2,000 years has been always persecuted. Now Mark was a Coptic church father, and the Copts have suffered more than just about anyone. We were martyred by the Pharaohs, and the world doesn’t really know anything about it. Then the Romans… they started killing us. Then, the Greeks. Then Islam. So all along now, for the last 2,000 years, our church has been persecuted by all sorts of people. But, when Europeans came to Africa, in 1,660, people said, “Oh, it’s [Christianity] imported from Europe! But we said, “Oh no, it (Christianity) went from here to Europe.” And this is true. That’s where Thomas Oden went [with his scholarship]. So that proved that Christianity had spread that the African religion had changed the mind of the whole world; that the monasticism came from out of Egypt; that the creed written by Athanasius and the other writers were Egyptian. So, the early the early African Christianity took the whole world with it. Question: Can you tell us more about your experience here in South Africa? Bishop Markos: I remember being told the story of Saint Mark, how he lived and was persecuted. I really felt that Mark was really touching deeply my sin. One man can make this difference! One Egyptian! One Libyan who came to Egypt and established this. Mark can do that, and yes, really the Lord can do that. It proved to us, that one man, if the Lord is in him can do a lot... So, um, Mark spread the Christianity everywhere, and also many others. Preachers and Christians all did - but Mark was a really, really special type of blessed man. He was so simple and humble. But he still wrote a Gospel, you know that? In the year 50. Anyhow, when I grew up as a young man, knowing Mark, I knew that Egypt was Christian, and I knew quite a number of Christians, but the Muslims tried to put the number down. But I knew that this [spread of the Christian gospel] was happening in Ethiopia too, because I lived there for nine years as a medical doctor and as a lay man helping in the church, helping to develop Sunday Schools and the youth. Question: Ah, so you’ve been a medical doctor practicing for a while? Bishop Markos: Yes. I started supporting myself with a salary I got from the Ethiopian Development Ministry of Health and also I stayed nine years from 1966 to 1975 and I was very well known to the church… and I had made the relations between the two churches, Egypt and Ethiopia. But south of the equator there was no Coptic work in the church. In 1976, I went to Kenya and established 16 churches and 20 Kenyan priests in 22 years. Then, in 1984, I started in Zambia. I established churches, in Zambia. I bought the land and established churches in Zambia and, in 1988, in Zimbabwe. And now we have three churches in Zimbabwe... And here [in South Africa] we have eight churches and a Coptic monastery, by the way. Then after that, in the late 1990s, we established a church in the Ivory Coast… After that, in the early 2000s, we started a church in Ghana and then in 2010 we started the church in Gabon. And then in Uganda in 2010 or something. And… now we have also a church in Malawi established. Question: Do you find these churches that you've been planting are for Egyptian Copts who live in these places, or are you finding people new to the Coptic church? Bishop Markos: My great attention is to grassroots. That's why you can say, here in this country, now we have three main responsibilities toward Christ. Now monastic life is there. We have a monastery, several monks, and they live the life, a monastic life, celibacy and everything. And I thought it was the mission toward the Africans and so it means we eventually go into far places and villages and we teach the people the truth. Some young men will be the recruits and we teach them. We send them to Egypt for a scholarship in surgical oncology for two years and then they come back. We order them as deacons or as priests. That's why we have eight churches in this country. They are all the priests or the legacy of Zulu. They translated more than 14 books into Zulu and so on. So [they are] not only just making it verbally, but also in written form. Question: What's the relationship like in the Sub Saharan Coptic church with other parts of the Christian church? Do you feel like you guys are working together or is it a little bit difficult? Question: What was that like, for the Coptic church when that happened in Libya? Bishop Markos: Imagine how difficult it was for the families that lost them in prison, you know. But the whole people were saying, "we would like to be like that." And all of them, they were really praying. By the way we understood behind the lines those fundamentalists in Libya, they kept them under severe pressure for a month or two, trying to make them deny Christ, and right until the last moment when they were slaughtered on the seashore, they were praying and saying, "Jesus, I'm coming to you!" That affected one of the men who was killing them, and they converted him, and he was martyred also. Yes, it's well known. And he was baptized, not by water in the church, but he was baptized by being slaughtered in baptismal blood. Question: Many orthodox people watched the actual beheading to make themselves stronger. And they watched it again and again and again. Why did they do this? Bishop Markos: Can I tell you the real wisdom of God in that? Those Daesh people, they wanted to say to the world, "We are coming to slaughter everyone who disagrees with us because we are at the top. And otherwise you are infidel, if you don't follow us. And here is this, our reward to anyone who opposes us.... slaughter on the sea shore." When they did that, they thought the whole world will kneel to them. Believe me, it gave the whole world greater strength. We also have got a message about this: what's important for us... to say that for me, "to live is Christ, to die is gain." So life for me is Christ, and if I die it is gain. It causes the opposite [effect that ISIS intended]. Glader: Right. Yeah. I wanted to go back to your early comment about Sunday School in the 1960s and to tell us more about that. Did you continue the Sunday Schools in all the churches you planted? Bishop Markos: Maybe the persecuted Christians started to feel that the future of the children (in such an over-fanatic Muslim Egypt) is bleak. So a movement, a great movement of migration started to America, Canada, Australia, Europe and everywhere. The Egyptians, as it is written in the book of Acts, after the death of Stephen, many of the Christians spread. Many of the Copts, migrated to other parts of the world. So the Coptic church spread everywhere. You can't imagine now how much it has spread in North America. I think now we have at least 200 Coptic churches [in North America]. And they are very active! I told you that I went to America more than 50 times. In 1983, I was in Nairobi at that time. So I went in July with my elder brother who is the pastor of Michigan. By brother when he saw me, he said, "Look, now the school holidays and our youth are exposed to all sorts of attractions. So I wanted to care for him. I said, "Splendid! You know what, I… can send them a spiritual mission for a week." He said, "Right?" I said, "Yes!" He called them to Detroit and then Chicago, then Cleveland and Toronto. We've got over 100 youths, and we found what is called Hope College nearby. So we rented a place for us to stay and eat and to have a week retreat, for youth. Then all the priests and the youths from these churches came. And we spent a lovely week praying together, singing together, having Bible study discussions and also workshops. After one week these people said, "You come every year." And I really did go for 25 years uninterrupted every August, September, July, in America. And then I was there, I think in 1986, and our pope, our main pope, he was there in America... he came for a visit. So I phoned him. I said, "I'm here." He said, "What are you doing there?" I said, "I'm in Michigan, and we have a big conference of youth, which has about 450." By that time, the word had spread. Now we are gathering the youth from 14 churches, and we hired a bigger university. Anyhow, so suddenly he said to me, "What are they doing here?" I said, " I am making a conference for the youth of North America. He had with him, the bishop of youth, the school bishop. He said to the bishop, "You go and see what he's doing there!" So the bishop came with us and he started spreading this all over the world, now." Now there are youth conventions every year in America and Canada. [The church has set up similar conferences] everywhere in the whole world... So all over the world and now we have Sunday schools. The Sunday schools is an important activity of all our churches in the whole world. I tell you in Egypt alone, we have about 2 million children in Sunday School every week. In America, we also have thousands and thousands and thousands, not only for children but also for youth. And this is the strength of the church. A church without youth is a church without a future. A youth without the church, is a youth that is lost. So really the real strength of our church is here… I think it is within our blood because our Christianity is now 2,000 years old and we love it. We feel that this is our life. Without it, without this, we will have no life. Question: We see in what we call the mainline denominations in the U.S.is a question on whether the youth gain the knowledge and spirit? Is it cultural or is it spiritual and intellectual formation for them? 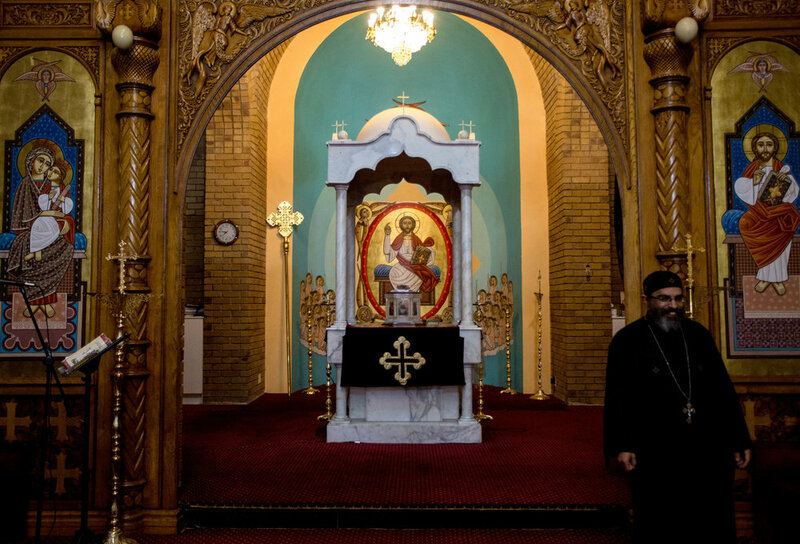 It sounds like the Coptic church is working hard to make sure it is not just cultural?